Focusing on the importance of contact with nature, design implications, and innovative solutions that help participants take information and new skills back home to change their spaces. The Natural Learning Initiative (NLI) held it’s 6th Annual Design Institute, Design for Children IN Nature, on August 7-9, 2008. The Institute was hosted by the Marbles Kids Museum in downtown Raleigh. Participants included landscape architects, designers, public health professionals, childcare providers, educators, extension agents, master gardeners, parks and recreation professionals, horticultural therapists, and others. 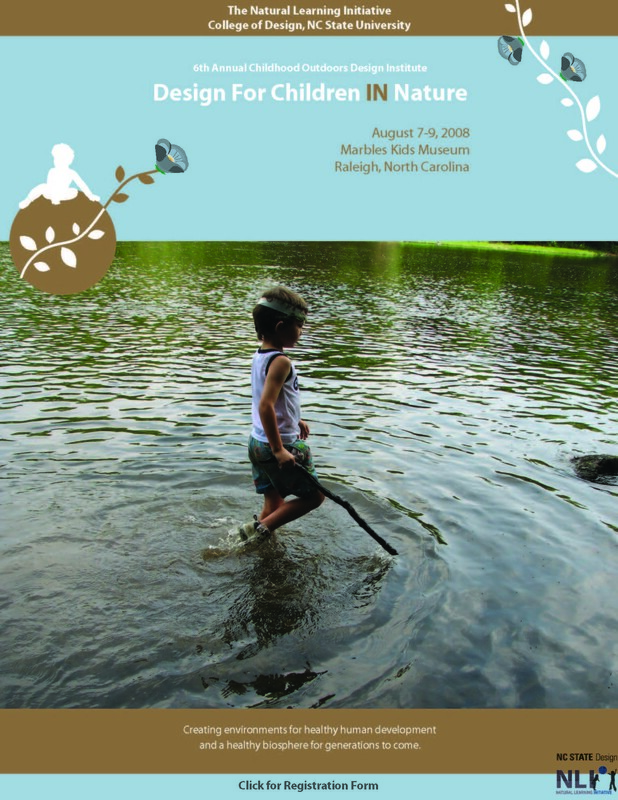 Outdoor activities were held at Prairie Ridge Ecostation for Wildlife and Learning, North Carolina Museum of Natural Sciences, which focused on hands-on Playwork training. Dr. Martin Maudsley, Leonie Labistour, and Daniel Rees-Jones (UK) helped us rediscover the magic of being in nature. As experts in playwork, they lead two sessions of hands-on play and reflection at Prairie Ridge. Cam Collyer, Director, Learning Grounds, Evergreen, Toronto, Ontario. Challenges and Opportunities for Creating Green School Grounds. Nilda Cosco, PhD, Education Specialist, Natural Learning Initiative, College of Design, NC State University, Raleigh, NC. The Benefits of Playing in Nature. Martin Maudsley, PhD, Coordinator, Wild About Play, United Kingdom. Playing on the Wildside. Robin Moore, Professor of Landscape Architecture; Director, Natural Learning Initiative, College of Design, NC State University, Raleigh, NC. Landscape Design for Healthy Child Development. Julie Sherk, RLA, Adjunct Assistant Professor of Landscape Architecture; Landscape Architect, Natural Learning Initiative, College of Design, NC State University, Raleigh, NC. Participatory Design Processes. Nancy Wells, PhD, Environmental Psychologist, Associate Professor, Cornell University, Ithaca, NY. Does Nature Matter? The Natural Endowment and Children’s Well-being. Nancy Easterling, MSW, HTM, Coordinator of Horticulture Therapy and Children’s Programs, North Carolina Botanical Garden, Chapel Hill, NC. Public Gardens: Growing Healthy Children.